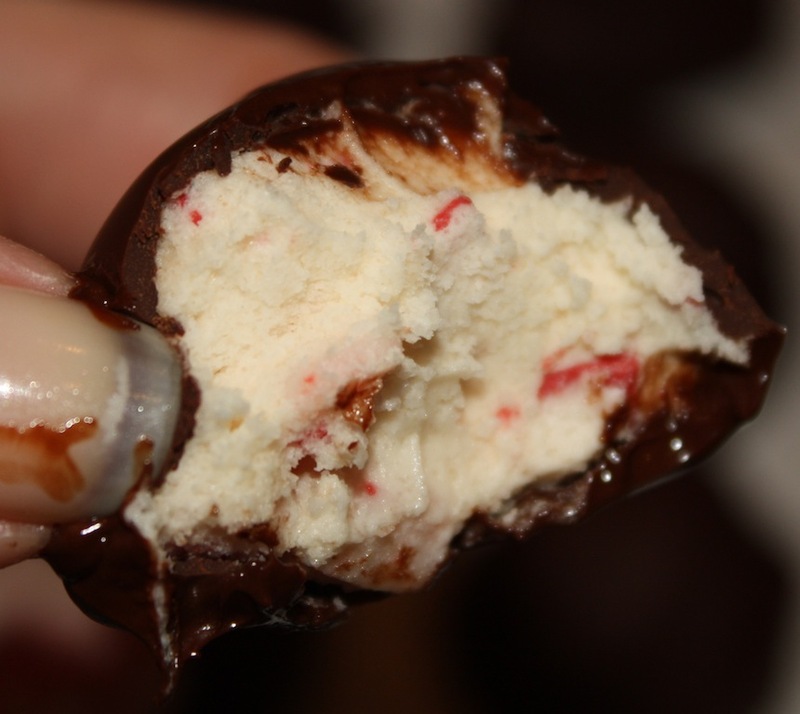 This is the time of year when I love to see red and white peppermint desserts combined with chocolate. Actually, it goes beyond that. I love to see, bake and eat these desserts! This past weekend I was going to a latke showdown party. Two of my friends were cooking latkes and I was asked if I wanted to whip up a batch of these potato pancake treats. I very quickly and kindly declined that lovely offer and instead said I would be bringing a dessert with me. I mean, really, if given the choice of greasing up my kitchen, which will then smell like latkes for days, or baking something scrumptious where cleanup will be a snap, is there really a decision to be made? I love Chocolate Chip Cookie Dough Truffles and thought perhaps there was a way of twisting that recipe around to satisfy my peppermint/chocolate desire. Guess what? It worked…beautifully. Peppermint Crunch Cookie Dough Truffles are a breeze to put together; the most time consuming part is dipping them in melted chocolate. Yet, because this may be done anytime after the undipped truffles freeze for a bit, I do not find it daunting. I simply dip when it is convenient for me. Christmas is just days away and New Year’s Eve will be here before we know it. 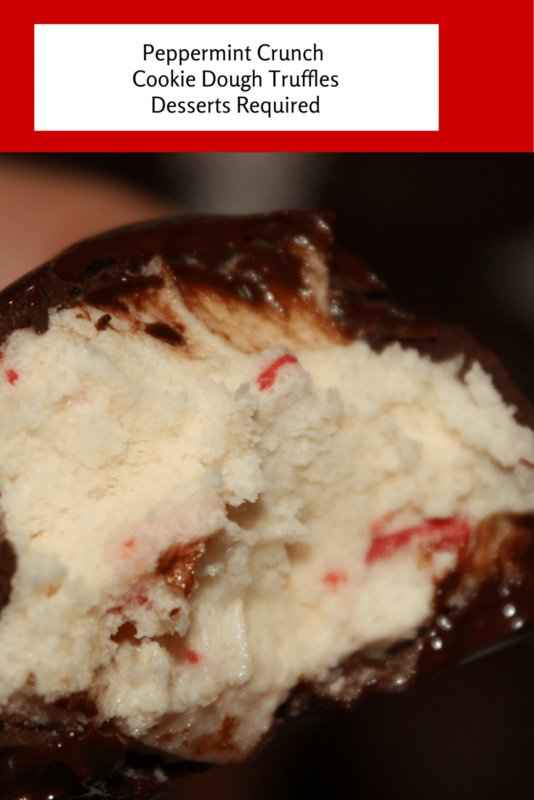 Peppermint Crunch Cookie Dough Truffles are the perfect way to ring in either holiday. Better yet, double your batch so you have plenty to share with those you love on both holidays. Wondering about that latke party? Well, all the latkes were delicious and we found that after eating a plateful of them the Truffles did a beautiful job cleansing our palates. After all, peppermint and chocolate make a refreshing and winning combination. Line large baking sheet with parchment paper and set side. Place butter and sugar into large mixing bowl and beat for 3 minutes, scraping bowl down as needed. Add flour. Blend in Andes chips. Use a 1½ teaspoon cookie dough scoop to measure and shape truffles. Place scoops onto parchment lined baking sheet. Freeze for at least 1 hour. Line a second baking sheet with parchment paper. Dip truffle balls, one at a time, into melted chocolate and place onto clean parchment paper. Once all truffles are dipped, return truffles to freezer to set.